Knight’s DSD Quick Connect Star Rail Series has a Spline Lock Tube design that is extruded from a lightweight, high-strength aluminum alloy. This series is a versatile and modular system of customized components needed for the creation of workstations and fixtures. It is the ideal solution for multiple applications. Knight’s DSD Quick Connect Series star rail is available in three (3) sizes. It is easy to assemble and does not require welding. 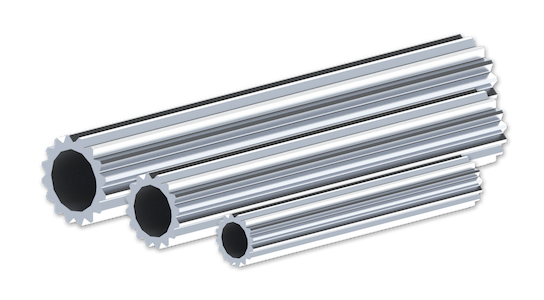 Mechanical Properties: ASTM B221 6005-T5 Series Aluminum. Max. Capacity: Contact for Capacities. DSD1108 1.4 lbs/ ft. [0.64kg/ft.]. DSD1109 0.9 lbs/ ft. [0.41kg/ft.]. DSD1110 0.5 lbs/ ft. [0.23kg/ft.]. Rail Lengths: Up to 12 ft. [3.65m]. 2 in. [50.8mm] O.D. / 1.4 in [35.6mm] I.D. 1.5 in. [38.1mm] O.D. / 1.0 in [25.4mm] I.D. 1 in. [25.4mm] O.D. / 0.57 in [14.5mm] I.D.